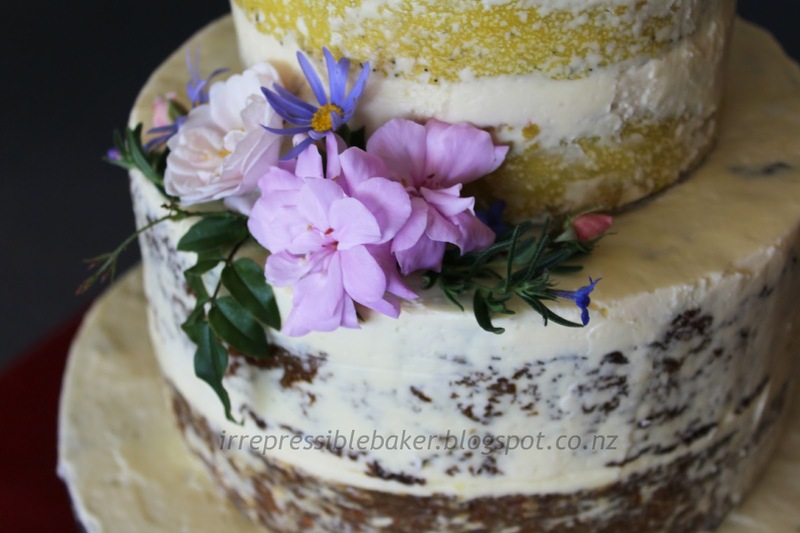 Nothing like a sick day off work to remind me I have some blogging to catch up on – it would be wrong to just leave things hanging half-way through ‘Three Weddings and a Birthday Cake’, right?! After this wee series I PROMISE to put some actual, rustic, homemade, genuine baking ideas up; even I can’t look at cake decorating inspo all day. Well, except maybe on sick days… in between binge-watching the latest two seasons of Rookie Blue (I feel totally ok if the series isn’t renewed after the Season 6 finale, I’m in a good space right now). 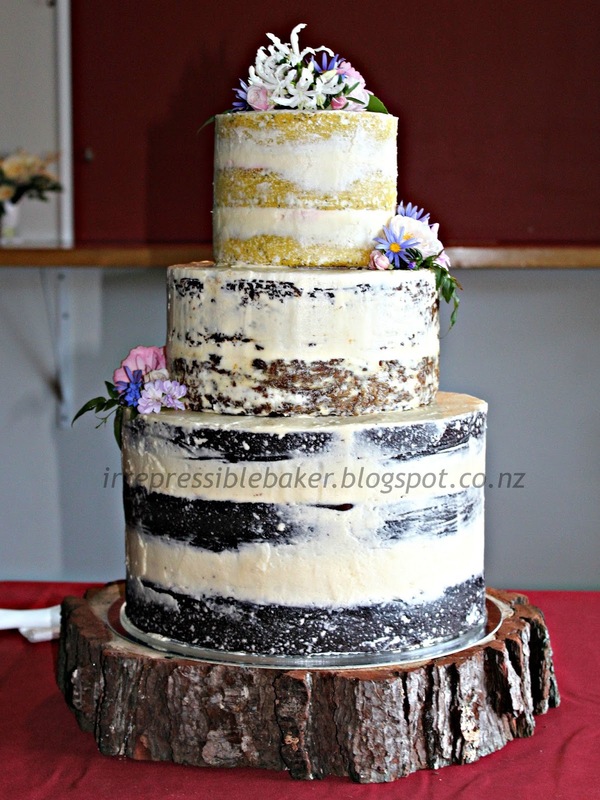 That delightful number was C & K’s inspiration cake for their wedding at ANZAC weekend this year. 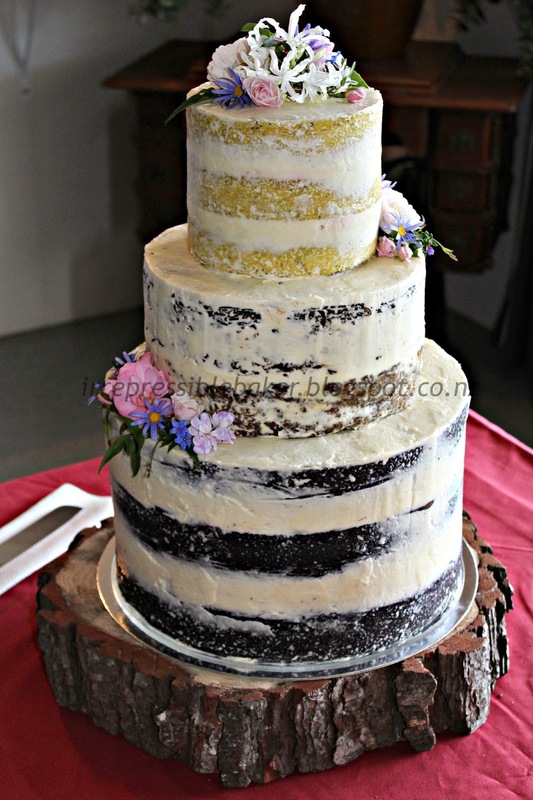 My third wedding cake ever, this one was to be the most ‘organic’ design – so natural compared to the thick layers of fondant, and less piled-on than the buttercream-slathered look. 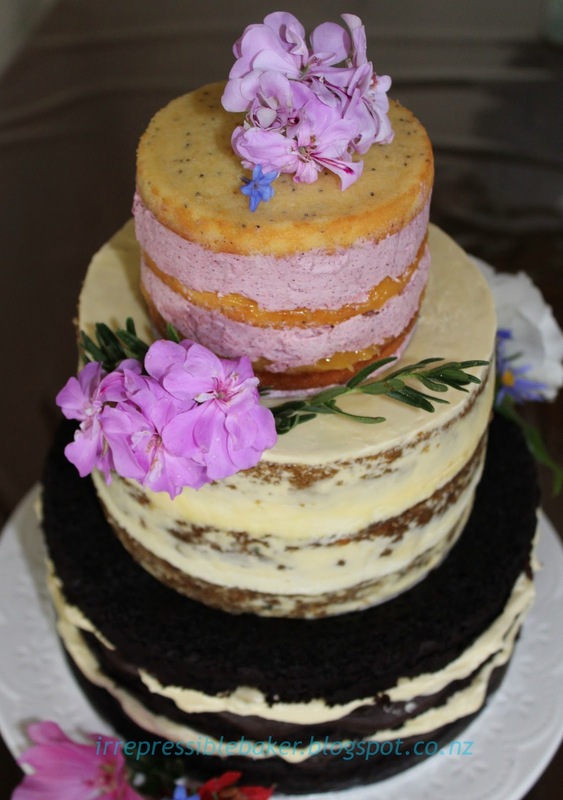 Naked cakes typically have little shaping done to them, the filling between layers is visible and the barest amount of icing is smoothed around the outside (kind of like a light dusting of snow!). Topped with fruit or flowers, no cake could be fresher! 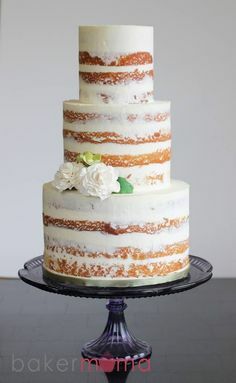 For this practice cake I used three different covering methods: naturally oozing filling (bottom tier), scraped filling (top) and ‘snow dusted’ like the inspo cake for the middle tier. C & K stuck to their guns and decided to go with the latter, and liked my garden flower arrangements enough to entrust me with the task of preparing the decorations as well! 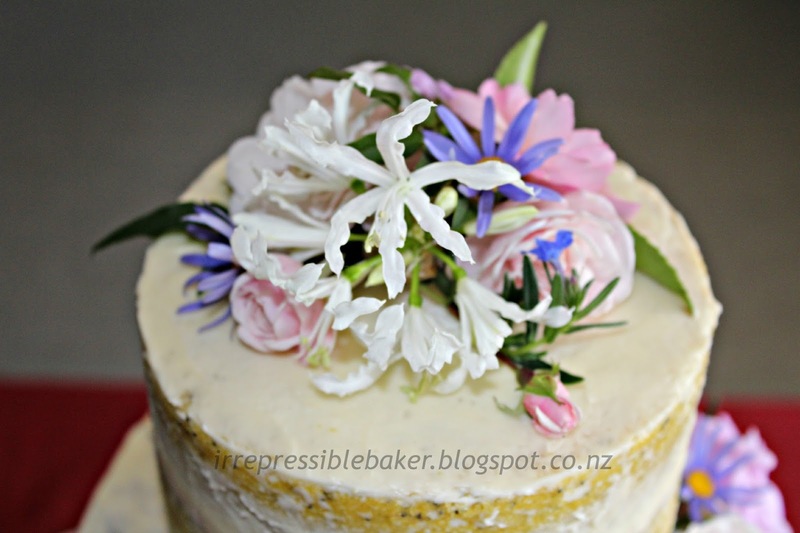 … And to sing to the flowers in my wee garden, in hope they would be blooming at the time of the wedding (an end-of-April wedding could be a chilly autumn event in New Zealand). 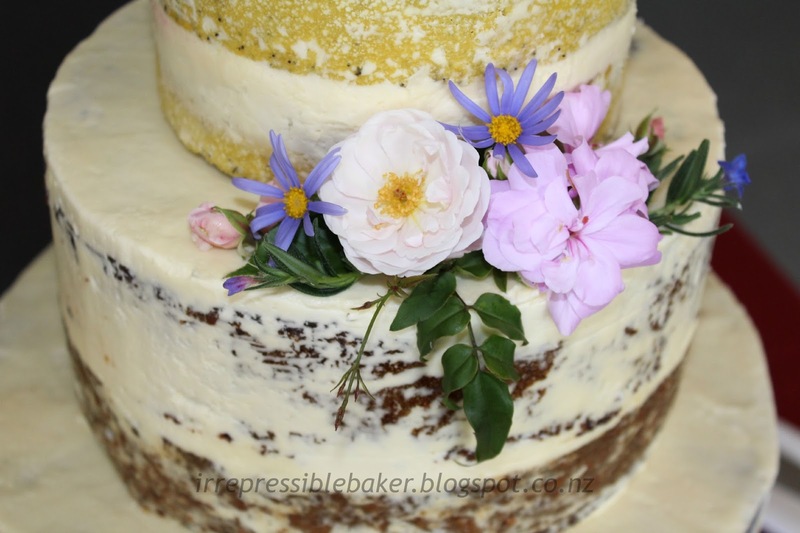 Fortunately, my singing didn’t shrivel the flowers, but I did have some trouble with one of the carrot cake layers under-cooking, hence the middle layer is not as tall as I would have liked. Still, the three tiers you see here were served along with two slab cakes (one each Choc Guinness and carrot), so there was plenty of cake irrespective! 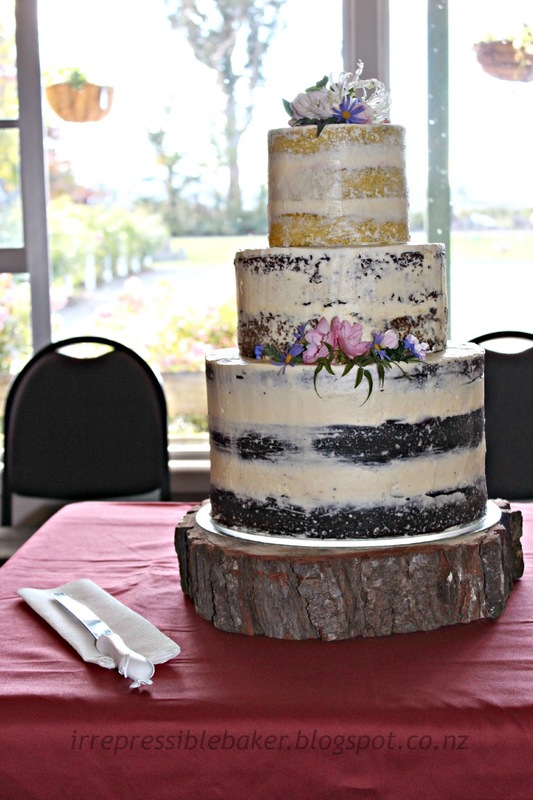 My tree trunk cake stand was made for such a rustic, natural cake as this! 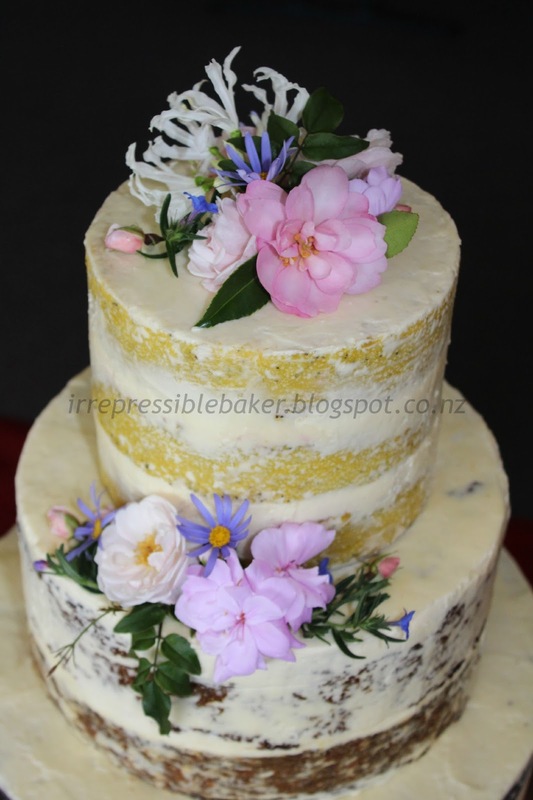 The gorgeous white frilly lily-like flowers along with the lovely soft pink rosebuds came from our neighbours garden, after she had heard of my weekend caking requirements! The blue daisy ones are from my Felicia bush, the small blue ones are from a ground cover with blue star-shaped blooms, the pastel purple ones are geraniums, I threw in some smaller pink camellia blooms, and some jasmine leaves make up the foliage.